Professor Mathstein has been busy trying out his rounding numbers time machine. While the machine works and runs smoothly, Professor Mathstein requires assistance in getting it started. He needs someone to activate the machine as he waits inside the capsule. 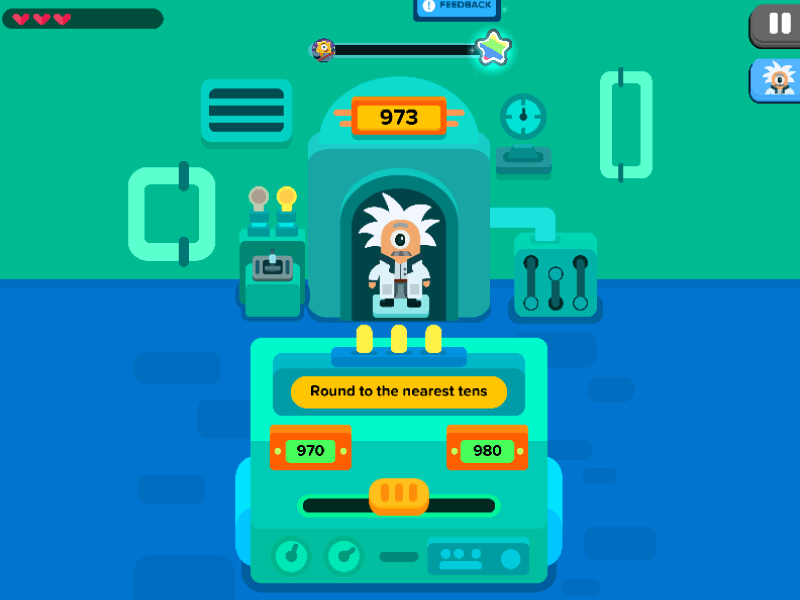 To activate the time machine and get the professor’s journey started, round the number provided on the top of the capsule up to the nearest tens. There are two options available on the control panel, and each of them is a number relatively close to the number shown. However, only one of them will work on the time machine. Pick your answer by swiping the bar towards the number that you require. Once you have done that, the time machine will start up. If you have succeeded in rounding numbers to the right answer, Professor Mathstein will disappear right before your eyes. Which means he is probably hanging out with The Beatles as we speak! However, if you get the answer wrong, the time machine will sputter and create a small explosion, resulting in a very angry and blackened professor. Time travel is tricky, so just try again and hope the professor does not stay angry for long! Time Machine is a game that expands the understanding of place value. This knowledge progression is applied to the training of learning to round things up to the nearest ten. By practicing to round 3-digit numbers up to the nearest ten, you are setting a very solid foundation for future mathematical concepts and observations in summarising whole numbers to closest estimations. It takes time to round numbers up!